Hello DMS subscribers! After the response from my last article I wrote covering Doug’s Applescripts for iTunes, I’ve decided to do regular tips & tricks posts here on the DMS blog. Today I’m going to cover my personal strategy for file management, and how this can help reduce the headache of migrating your library to a new DJ laptop. I know everyone has their own methods for organizing files. When it comes to constantly downloading new music, many of us are guilty of digital hoarding. This often leads to having WAY too much music in your library, with only a small subset of tracks that you actually use regularly in your gigs. I suggest that you relocate these often-used tracks into their own special folders, which I do once a month (or whenever I get to importing and sorting new music) that you could one day easily copy to a new computer in the event of a complete meltdown. In this example, we’re going to use Serato’s File Browser to relocate a subset of music from a crate into a new folder location in the Finder. 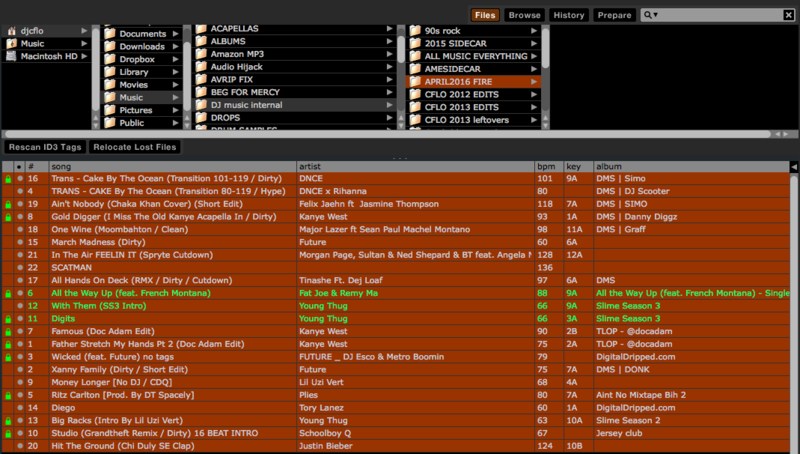 As you can see in the screenshot, I’ve created a folder in my User/Music/DJ music internal/ folder titled April2016 FIRE After navigating to that folder in the File Browser inside of Serato, I’ve selected all tracks in the crate of new hottness and dragged those files onto the folder. A dialog box pops up with the options to [Copy] [Move] or [Cancel] Since I want to relocate the files on my hard drive, I chose to Move these files. They are now moved on the Finder side of the Mac from their location (Desktop, Downloads, wherever) and relocated to the new destination inside your Music folder. The goal here is to have all your go-to tracks, the ones you need in the event of a total meltdown, inside of one folder you can easily copy off of your Mac. 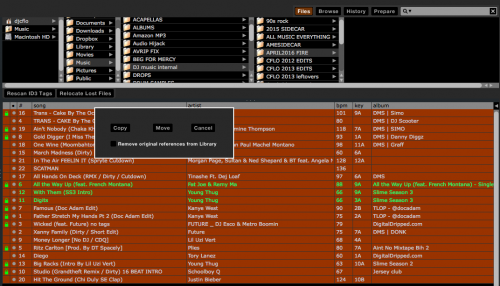 This makes it easy to, at the drop of a hat, buy a new computer and copy this folder onto your new machine, drag it into Serato, and play a gig that evening without having to worry about a Serato Library or rebuilding your crates. 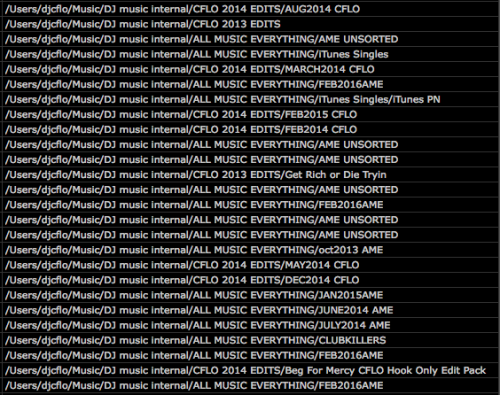 If you do this consistently, all of your music will live in one place, however you have it organized. The alternative is that you likely have some songs located in your iTunes Library folders, some more scattered in Downloads, some in project folders inside of Ableton assets, and even more on the Desktop in various folders labeled “New NEW June” living right alongside other MP3s that you never even use, and yet continue to hold on to! By placing your regularly played tracks all inside of one common root folder, you can prepare yourself for an easy move, both through backups and recovery. Maybe make your spring-cleaning goal a digital one this year, and relocate all the scattered mess you call your life into at least your User/Music folder to start. I’m NOT talking about reorganizing your crates here! I’m advocating a mindful intention of the location of your hottest tracks on your hard drive. Lastly, I’ll leave you with a screenshot of how my hot fire crate looks if you scroll all the way to the right and look at the Location view.